On Saturday 25th October, a group of nine staff from Jubilee Hall Trust will take on the fearsome Tough Mudder assault course in Winchester. The 12-mile cross country run has obstacles designed by special forces personnel with names like Leap of Faith, Everest and Fire In Your Hole, to test both mental and physical strength. 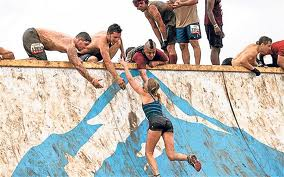 Tough Mudder events are untimed and to date more than 1.3 million people worldwide have taken part.